Here’s one more reason to be all-in on Star Wars even though I’m a late-joiner. 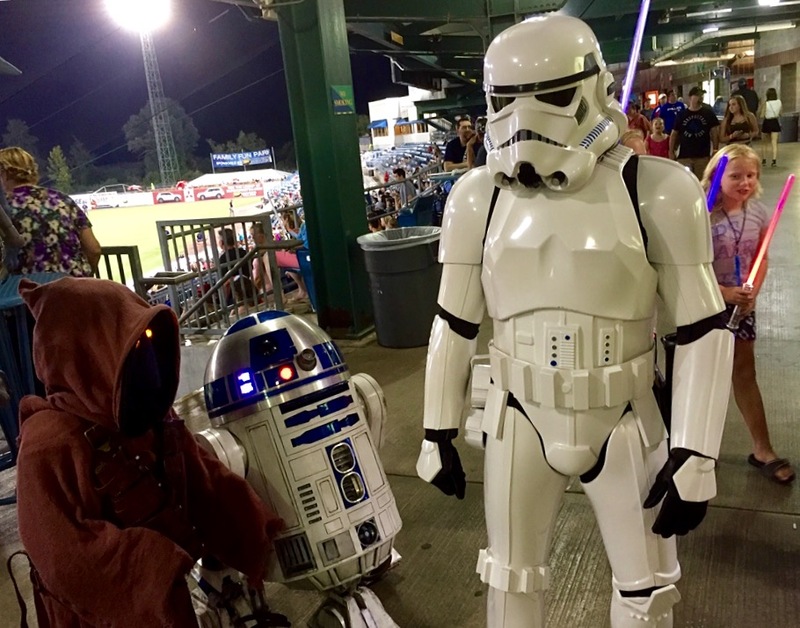 The Syracuse Chiefs know how to throw a night to celebrate the funk, fun and finery of the (inter)stellar movie franchise. The Saturday night at NBT Bank Stadium my dear wife Karen, who wonderful daughter Elisabeth and tremendous significant George Three spent with a crowd of 6,917 was Oscar worthy. Oscar Madison, of course. The Chiefs front office, led by erstwhile hometown general manager Jason Smorol, gathered up the Star Wars gang and spread them throughout the stands and put them on the field for pregame ceremonies. 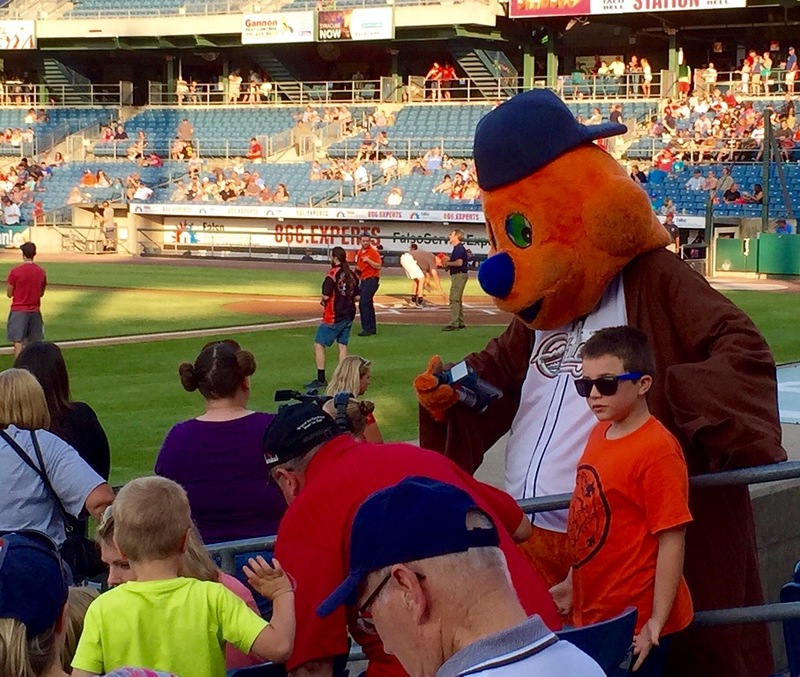 Popular mascot Scooch became one of the Darth Vaders for the evening. No fur on these guys. For this Saturday night against the Lehigh Valley Iron Pigs, the Chiefs put on Chewbacca uniforms. Thankfully for them on this warm night of Aug. 20, 2016, the designers left off Chewie’s hair. On any regular game night, the Chiefs make sure there’s plenty of entertainment. Wait. There’s no such thing as a regular game night with this crew. 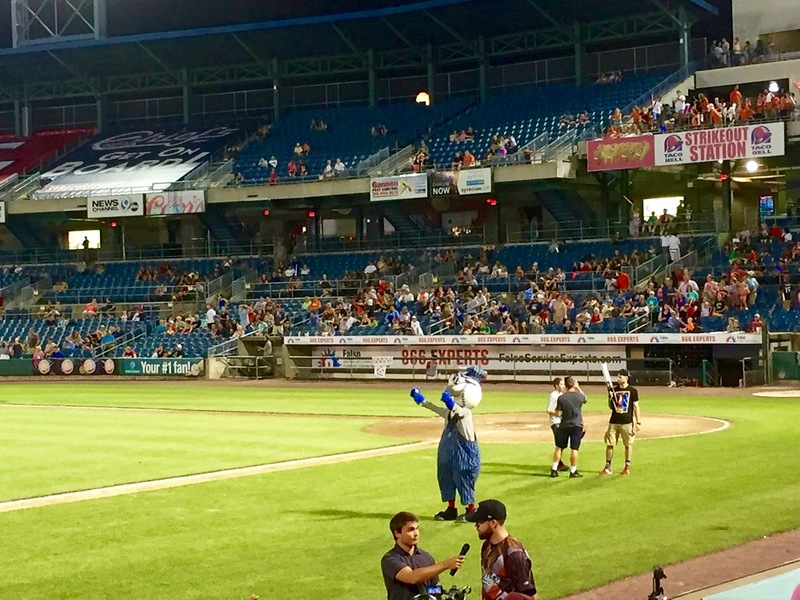 Every time out, there’s something cooking at NBT Bank Stadium. Saturday night games feature Little League squads introduced for all to cheer. 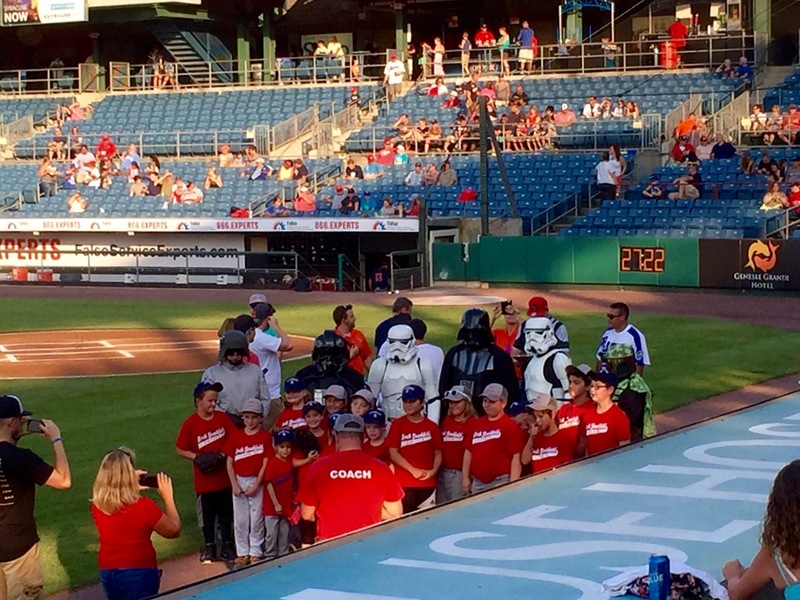 The lucky young ones representing the North Brookfield Firemen got to meet the Star Wars characters on the field. The teams traded home runs and timely plays until the home squad’s shortstop, Jason Martinson, hit a blast to right center in the bottom of the eighth to seal a 6-5 victory. Then the sky lit up with fireworks. Which is your favorite Star Wars character, and why? Which is your favorite photo, and why? Baseball or movies, and why? I like the last photo of the interview on the empty field with the Mascot standing waving to the crowds. Very cool night and photos Mark. I may have missed this but what is the connection between the Start Wars characters and the game that night? Chewbacca is a good egg, Beth. But those Chewie uniforms for the Chiefs were a real stretch, I thought. 😮 No fur!